TBP (Durban, South Africa) – “It’s done,” announces South African finance minister Pravin Gordhan. 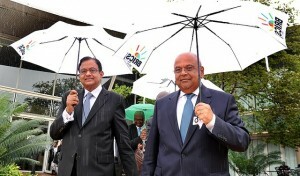 Putting all speculation of “yes”, “no” and “maybe” to rest, Gordhan announced the formation of the BRICS Bank after meeting finance ministers from BRICS nations in Durban. However, he left the details to be announced by the leaders during the Summit tomorrow. The BRICS Development bank is a lending institution on the lines of the World Bank and regional development banks. Emphasising that BRICS mean business, President Jacob Zuma had said yesterday: “We are able to discuss things and take decisions.